Everyone needs a signature dish. Something that’s easy and effortless, and an overall crowd pleaser. Ideally, it can be made ahead of time too, and doesn’t require a strict recipe. This dish is exactly that. It’s my summertime specialty which is so simple (and tasty!) you’ll make it over and over again. The tortellini can be made 2-3 days in advance which is a great time-saving bonus. After cooking and draining, lightly coat in olive oil to prevent sticking and refrigerate until ready to use. Also: if you double the amount of tortellini, save half for dinner to serve with a quick tomato sauce (recipe in my cookbook). Then, if you’re in the mood, prep the rest of the salad. Now, not all veg is meant to be prepped ahead (but you already know that). Tomatoes will get really soggy and chopped green herbs will turn an ominous shade of black (not parsley though- it’s a super herb!). Here, diced bell peppers and thinly shaved cucumbers hold up just fine, about 1 day in advance. I like to use my mandolin to slice the cucumbers paper thin. Store the vegetables in separate containers with a damp paper towel over the top to preserve freshness. When ready to serve, toss everything together with white balsamic vinaigrette and LOTS of fresh herbs, including mint, basil and dill. I’m using white balsamic so that the tortellini doesn’t turn brown. If you have regular balsamic, that’s okay too. It won’t be that brown. Remember, this salad is flexible so add more dressing, salt and pepper, and even black olives to suit your taste. 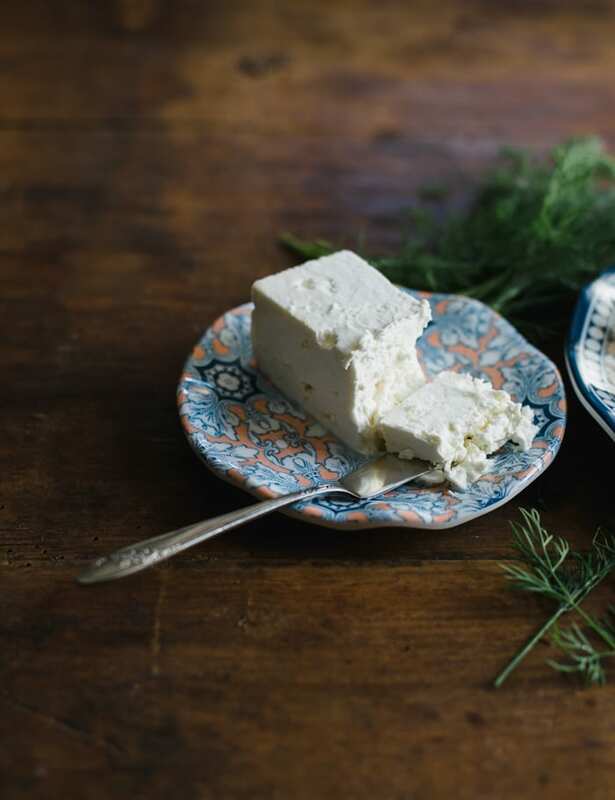 But do yourself a favor: only add the feta at the very end, so it doesn’t disappear into a cloudy mess when you toss the salad a hundred times. If you like the pretty plates and bowls I’m using in the pictures above, Q Squared NYC is giving away a 12 piece collection of your choice! Comment below and tell me your favorite summertime signature dish (bonus points if you mention your favorite Q Squared NYC Collection, too!). Contest is open to US residents and will end on 8/3/16. To shop now: use code CLEVERCARROT20 for 20% off everything online. It’s currently active from now until Labor Day. *This post was sponsored by Q Squared NYC. All opinions are my own. Thanks for your continued support! * You will have extra vinaigrette leftover. Store in the fridge and use for salads during the week. Make up to 1 week in advance. 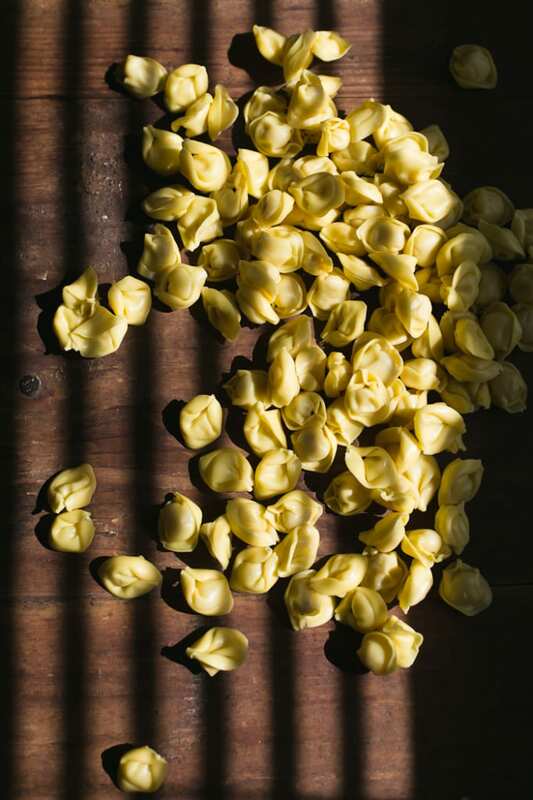 ** The tortellini can be cooked 2-3 days in advance; coat lightly with olive oil to prevent sticking and refrigerate until ready to use. The bell pepper and cucumber can be prepped one day in advance; store in an air-tight container with a damp paper towel over the top to preserve freshness. The tomatoes and herbs are best chopped fresh. Cook the tortellini according to the package instructions. Drain and run under cold water to remove any extra starch. Transfer to a large bowl. Coat lightly with olive oil to prevent sticking. Chill before using. Meanwhile, make the vinaigrette. Add the balsamic vinegar and olive oil to an empty jam jar. Season generously with salt and pepper. Screw the lid on tight, and give it a shake. Set aside. Right before serving, combine the tortellini, tomatoes, peppers, cucumbers into a large serving bowl. Thinly slice the dill, basil, and mint and add to the bowl. Drizzle some of the vinaigrette over the top, season with salt and pepper, and toss well. Crumble some of the feta over the salad. Even though it involves using the stove, I love making caponata in the summer – eggplant, tomatoes, basil – just tastes like summer to me. Also, anything with fresh corn. my favorite and go to for summer is anything summer tomatoes ! big bowl of chopped tomatoes and garlic and basil and toasted sliced bread… can and do it this everyday ..
oh and stuffed roma tomatoes ! I always make Ina Garten’s potato salad for summertime gatherings. It is always such a hit! One of my favorite summertime signature dishes is a classic in our house: venison burgers from the grill with baked sweet potato fries. My absolute favorite is grilled pizza — a little charred on the bottom with a dusting of cornmeal, topped with wilted arugula, grilled corn, olive oil, truffle salt and a shaving of Parmesan. Easy and delicious but still fancy and feels special! I wonder if my family would call this a “signature” dish? I make a fresh coleslaw that whenever I make it, my family exclaims it’s SO much better than store purchased coleslaw! I guess that would be it! I make spaghetti with uncooked tomato sauce using fresh tomatoes, basil, parsley, olive oil and garlic. So good. My favorite summertime recipe is grilled corn on the cob! Summer screams salad, so I love to make many different varieties that include fresh berries, apples, nuts, and grilled chicken. It’s lighter for those hot summer nights but still fulfilling. Ohhh, cute melamine! Fav summertime dish is simply fresh summer squash from garden cooked down with a Vidalia — simple, delicious! My favorite summertime dish is sliced zucchini that have been grilled and then topped with sliced tomato and sliced mozzarella. Then it’s drizzled with good balsamic vinegar. YUMMY! I make a quick salad with cucumbers, black olives, grape tomatoes, feta, and a bit of balsamic vinaigrette- it keeps well and can be made ahead! I am going to make this pasta salad tonite! Looks delicious. Always reminds me of summer when we have Cedar plank grilled rock salmon. My favorite summertime dish is homemade pasta sauce, using tomatoes from my garden, poured over zoodles and served alongside eggplant Parmesan. To make the pasta sauce I just roast the tomatoes and add a bit of salt, pepper and fresh basil…It tastes so clean and fresh! El Paso Chopped Salad! Desert would be my mother’s blueberry bread pudding since we are entering wild blueberry season in Maine. But in a pinch, fresh tomato and herbs straight from the garden! My go to is fresh zucchini and eggplant stacks with fresh basil, tomato and mozzarella. My fav is Caprese Salad – I need one now! This summer it’s all about zucchini. I usually just saute with garlic or onions, tomatoes and throw in some chick peas and serve over angel hair. My favorite summertime dish is making Asian sesame noodles with a bunch of vegetables and finishing the meal off with homemade blackberry jam over vanilla ice cream. I love to prepare pan con tomate with jamon iberico and burrata. Perfect for a summer night. Pesto Chicken on the grill; marinate the chicken breast with white wine and rosemary add some lemon or lime grill and a few minutes before it is done pile it high with some fresh pesto with parm, add a side of iowa sweet corn and some muscatine melon and a chill white wine…”Is this heaven?”.. No, it’s dinner!! My favorite summertime dish is any meal involving fresh corn on the cobb. Growing up in Indiana, one of my favorite childhood memories was shucking the corn husks with my cousins. I absolutely love summertime cookouts with grilled chicken, watermelon, potato salad, and fresh corn on the cobb. I love South Your Mouth’s tuna noodle salad. My aunt made it when we were kids and I wasn’t able to find a recipe close to hers until this. Love it. My bread salad. I love it and so does everybody else. It’s also perfect for a summer potluck because there are no ingredients to turn bad in the sun and heat. Ooo, I want some right now! I love a twist on tabouli using ingredients from my potted garden – green beans, tomatoes, peppers, mint & parlsey with bulgar, avocado oil & fresh squeezed juice from an orange! 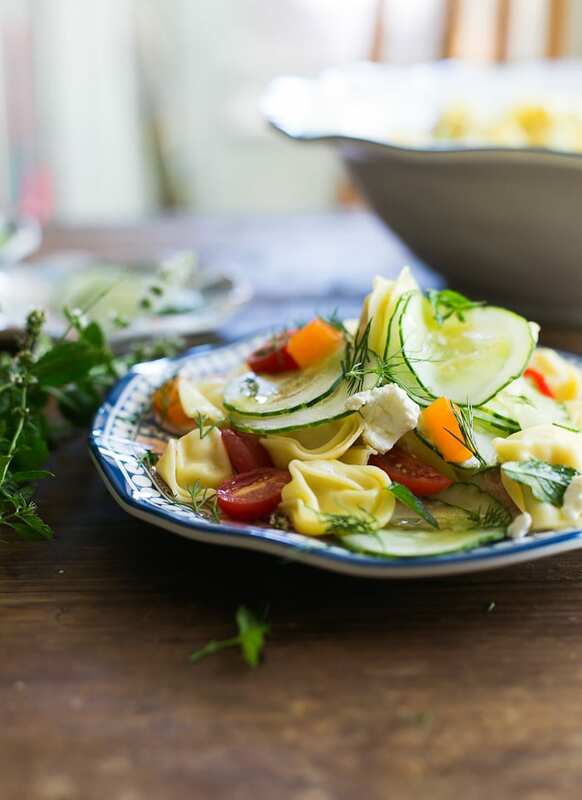 My go-to greek salad is very similar to yours, but I so love the addition of tortellini – great idea, and I will most definitely be adding that next time! Any salad with all the beautiful in season vegetables. I’m a college student, so quick, affordable, and reusable recipes like this one (and many others that you’ve posted) are my go-to! Thanks for providing another creative recipe to test out. My summertime signature dish is a watermelon feta salad with mint and basil, lots of baby spinach and cucumbers, and a balsamic vinaigrette. Using fresh mint + basil reminds me of my mom’s cooking, especially in the summer months when she always had a surplus of zucchinis and avocados and tomatoes to pair it with – and I’m a huge fan of any fruit and veggie combo dish! My favorite recipe is broccoli rabe,chick peas,cherry tomatoes,capers and a few pitted black Greek olives,tossed with sautéed garlic and olive oil over multi colored pasta . A few cooked lentils is really nice . One of our favorite summer time dishes is a garden veggie dish- either cold or hot. So it could be a salad with tomatoes, peppers and sliced baby okra or it could be chopped tomatoes, onions, garlic, peppers, eggplant and any thing else growing in the veggie beds that is stir fried in olive oil and served over brown rice or pasta. So many possibilities when the garden is producing! My favorite summer treat is just about any kind of salad. The freshness of summer veggies enhances their flavor sooo much!! So many wonderful salad combinations. And sometimes, the simpler the better, like cottage cheese with farmer’s market perfectly ripened tomato and a little black pepper. Ummmm… I just had that for lunch! :) I’ll be adding your great salad to my collection. My summertime signature dish is a black bean pineapple salad with fresh basil & mint. It’s so yummy & refreshing! I would love to say my signature dish is a healthy, light salad but my family thinks summertime means they will get fried zucchini. I am a happy ge fan of qsquared products! Excited! One signature summer family recipe is my ratatouille. Really healthy and delicious hot or cold..and for breakfast, lunch, dinner or a snack. And, a great way to use end of summer bounty of veggies. A delicious blending of Flavors..we love it. Your Greek tortellini looks yummy too. I LOVE salmon cooked on a cedar plank placed over warm or room temperature orzo with olive oil, lemon and fresh basil and tomatoes!!! SOOOOOO GOOD! My go to dish is Greek Turkey Burgers that have spinach,sun dried tomatoes, red onion and feta in them with a yogurt sauce. Everyone loves them. Aldi’s has a really easy recipe called SimplyNature Garden Bean Salad – I just LOVE it! It’s extremely quick with canned beans, spinach, avocado and just a few other ingredients. I mix up my own dressing. And the Pembroke is my favorite Melamine pattern! =) Thank you for entering me in your giveaway! I love to make avocado hummus! So light for a summer appetizer! I make a pasta primavera with rotini (the sauce loves it), tomatoes, avocado, and blanched broccoli, asparagus, and snow peas …all drenched with my special sauce (garlic, mayo, basil, salt and pepper). All the salads…fresh fruit salad, caprese…. My mom has a killer corn salad (that always tastes better when she makes it) – corn, tomatoes, cucumbers, zucchini, and lots of other good green goodies! Family recipe for years…grandma’s baked rice-stuffed tomatoes and roasted potatoes. Goes perfect with arugula salad with lemon-olive oil. I loved the Ruffle dinnerware! Love love love the cool, summer vibes here Emilie! And those plates, so pretty too <3. This is reminding me to pull out your cookbook this next week, I believe some peanut butter quinoa truffles are calling my name ;) hugs! Any cold pasta salad is so good during the hot summer months. My dad and I like to tag-team making grilled pizza, but I also really enjoy a nice, juicy watermelon diced and sprinkled with feta and basil. <3 So, so good! And bonus–that Q Squared NY Peony set is quite adorable! I like making my own fresh mozzarella and serving it with garden fresh tomatoes and olive oil. It’s easier than it sounds! Wow, does that ever look delicious! Thanks for the recipe. My signature dish in the summer is a chicken salad with granny smith apples, grapes and dill. I love the looks of the peony collection. Well, my fave summer dish is any kind of pasta tossed with pesto made from my home grown basil. There is something so very satisfying and tasty about food made from herbs picked right from my garden. I love tortellini. I love simple. Plus the Bella Donna pattern is surely my fave. I’d say this post (and the contest) is a winner all the way around! I am glad you are having a good summer, and I bet your vacation was terrific. Ben tornata! I love a pasta dish as a go-to as well! I make a no-cook pasta sauce similar to yours as my go-to with sliced kalamata olives, buffala mozzarella, basil, and cherry tomatoes. Beautiful dishes and photos as always! We love chicken salad in the summer. Also oven fried zucchini! Slice it lengthwise, dip in beaten eggs, then dip in fine Italian bread crumbs, then place on a baking sheet thst has had 3-4 Tbsps. olive oil spread on it. Sprinkle a bit more olive oil and salt on top. Bake at 400 for 15 min, turn and bake 10 more min. or till crispy. A good caprese salad with tomatoes and basil from our garden! I absolutely LOVE the Portsmouth dishes!! My favorite summertime signature dish is green salad with grilled chicken on top and Greek yogurt strawberry poppy seed dressing. My favorite Q Squared NYC Collection is Peony. My fave summertime dish is always fresh from my weekly CSA but usually involves a bright salad and something on the grill. Oh and watermelon! 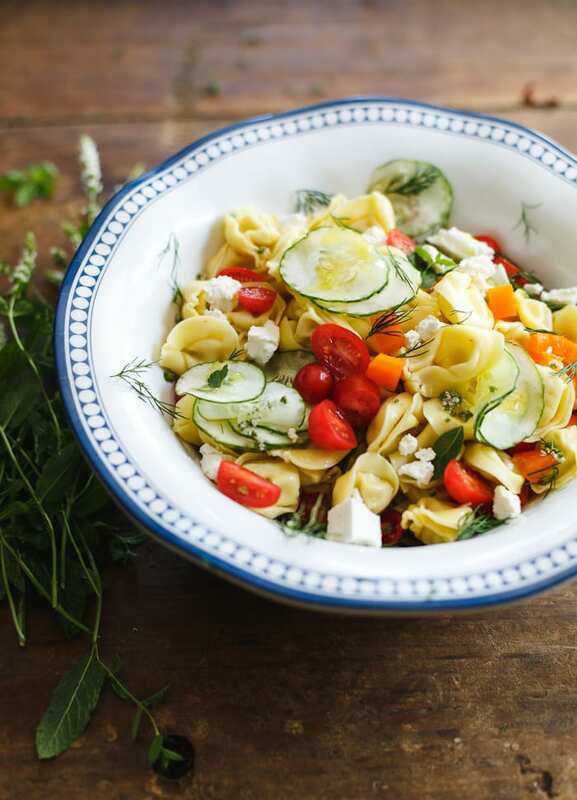 My favorite summertime dish is a light pasta dish that has summer squash and tomato. Thank you for the wonderful giveaway. My favorite design is the TALAVERA IN ROJA. I would have to say a perfect summer dish would be grilled lemon shrimp with a nice fresh corn and basil salad and the Talavera In Roja as the favorite collection. I love doing variations on pasta salad and whatever fresh vegetables and herbs I have available from the garden. My favorite of the dishes is the peony set. It would highlight all the beautiful colors of summer vegetables, herbs and edible flowers! Lovely table ware! Summertime means fresh berry cobblers around here. Also fresh tomatoes from our garden tossed in any dish. I love making anything with fresh zucchini from the garden. It’s such a versatile vegetable! The plates you used are so beautiful! I also love the Talavera in Azul collection. Gorgous dinnerware! My family and friends would say my signature dish is homemade Chinese dumplings. In summer I am fond of traditional Greek salad. I make a few times a week. Just tomatoes, cucumbers, feta, some good olive oil, garlic powder and oregano. I really like the Zen collection – I am a tree nerd. I love to make fruit salad with the summer fruits and carambola since my carambola tree fruit is ripe. I love the Fontainebleau pattern of the melamine dinnerware and the intricate designs. And the Palazzo or Royal Lapis are gorgeous! I love strawberry Waldorf salad during the summer! My favorite summer dish is Caprese Pasta Salad. And my favorite from the Q Squared NYC Collection is Talavera In Azul. Beautiful! My favorite summer dish is a tomato gratin using heirloom tomatoes from the garden. Really, any dish using these tomatoes is delicious. I like to make a grilled flatbread with ricotta and roasted veggies in the summer. And i love the Portsmouth collection from the Q Squared NYC Collection! I love a nice couscous salad, with lots of fresh tomatoes and even more feta. I love the Medina collection :). We love to grill in the summer – grilled veggies (with a side of margarita) is my favorite summertime dish! Thanks for the chance to win. I love to make vegetable or fruit carpaccio from what’s in the garden. I use herbs and flowers to garnish. This would look fabulous on the Dimond Collection plates. My favorite this summer has been green peaches with blueberries basil and nasturtiums with a honey vinaigrette. my favorite summertime dish is pico de gallo, made with fresh tomatoes from my brother’s garden. I’ll eat that stuff with chips, veggies, chicken, quesodillas, even just by the spoonful! I love cold noodles with savory peanut sauce and grilled lemongrass pork, especially on a hot summer day! love grilled zucchini in the summer and ALL the fresh veggies… especially sungold tomatoes.. all wrapped in a taco shell… and i love the diamond square dishes! A quick pasta dish with a no cook fresh tomato and onion sauce served over hot pasta while at room temperature. Yummy good~ and serve with a beautiful summer fresh tossed salad!! My favorite would be grilled pizza, especially margarita with tomatoes and basil from the garden. Of course the boys are a little hooked on cheese tortellini and pesto pasta salad so this would be a hit in our house. If only it weren’t so hot, my poor dill is burning from the sun. As for the dishes I love the pattern you chose, though Heritage pushes my buttons too. I’m a sucker for blue and white! It us hard to come up with just one summer salad but I loved a chopped salad with all the fresh veggies and roasted chicken on top. My go-to summer dish is marinated grilled veggies! I usually do a mix of zuchinni, tomatoes, eggplant, and anything else that I have on hand. I marinate the cut veggies in a light vinegarette aND then grill them. They are great in salad, quinoa, pasta salad, and by them self! I know it is old school,,,but soooooooo good on a hot day…pineapple jello salad with a cream cheese topping. Retro all the way! Southwestern Potato Salad is my signature summer dish and it would look even better served on Diamond Square dinnerware. For me, it’s grilled corn with chipotle aioli, sprinkled with a bit of coarse salt and cilantro… Perfection! My absolute favorite summer dish is from Susan Branch’s Summer cookbook. It is Lemon Linguine with Beach Street Cajun Shrimp. The spicy shrimp is the perfect balance to the simple pasta. Best part, it tastes great cold too, for picnics or leftovers (if there are any)! Thank you for introducing me to the Qsquared dishes. Perfect for patio meals! My favorite summer meal is BLTs with fresh tomatoes from the garden. Tough decision, but I think Heritage would be my choice. As for summertime classic — at least while we’re living on the NC coast — whole stuffed snapper on the grill! My favorite summertime recipe is a pasta salad with vegetables from my garden! Cucumber, tomato and avocado salad with feta cheese and a squeeze of lemon. So simple, but SO good!! I love the Red Talavarian and diamond square sets!!! My fav signature dish is broiled asparagus and zucchini slices. I cover them with olive oil, sprinkle with pepper and garlic salt, then broil. The last few minutes of broiling I add shredded cheese on top of the zucchini slices. My kids LOVE it!!! In the summer my favorite thing are salads but also really enjoy grilled veggie kebabs and a new favorite that I’ve started trying is grilled fruit kebabs. Pineapple is amazing grilled! My favorite set is the DIAMOND SQUARE 12PC MELAMINE DINNERWARE SET, it’s so simple and gorgeous yet modern. I love it! My favorite summertime dish is Chunky Chicken Salad I make with grilled chicken. It’s macaroni salad for me, the way my grandma used to make it. I love to make grilled pizza! My favorite is a simple but yummy sautéed squash right out of the garden! In the summer, I could literally eat a chickpea kale salad every day! Summer means fresh fruits and vegetables in salads. Our current favorite is Fajita salad using grilled fresh bell peppers, Walla Walla sweet onions, sweet corn and large shrimp seasoned with Mexican herbs and spices over greens with sliced avocado and tomatoes. So satisfying! My favorite dish pattern is Heritage, so lovely. I love to grill meats, chicken and shrimp, corn, peppers, onions, asparagus, squash, just about any summer seasonal veggies and I always make extra so that I can use the leftovers, especially grilled chicken, and veggies tossed with a light vinaigrette served with crunchy bread as a cool salad to beat the Texas heat. My favorite recipe is OLD SCHOOL TOMATO SALAD! Especially this time of year. Any baked good that involves fresh berries! Especially breakfast bars :) My favorite Q Squared NYC Collection is diamond white. So simple and perfect! GASP!! The Knoll Gardens set is to die for! Gorgeous. This summer’s go-to staple dish has been a curried quinoa salad with crisp apples, shredded carrots, and dried cranberries. Cold, crunchy, and delicious! My favorite go-to in the summer time is a simple salad of fresh grilled corn with split cherry tomatoes and smallish chunks of parmesan bound together with some greek yogurt topped with fresh ground pepper and sea salt. Yum! And that Bella Donna set at QSquared is motto delicious! My favorite summertime dish is a garden vegetable galette. Easy to make and so delicious with any seasonal veggies. LOVE the Palazzo and Medina collections! Chopped Fresh garden tomatoes soaked for hours in olive oil…..tossed over pasta. Sprinkled with basil. Summer in a bowl! Thanks for the beautiful giveaway! My favorite summertime dish is grilled chicken marinated with lemon and basil with potato salad and grilled corn. 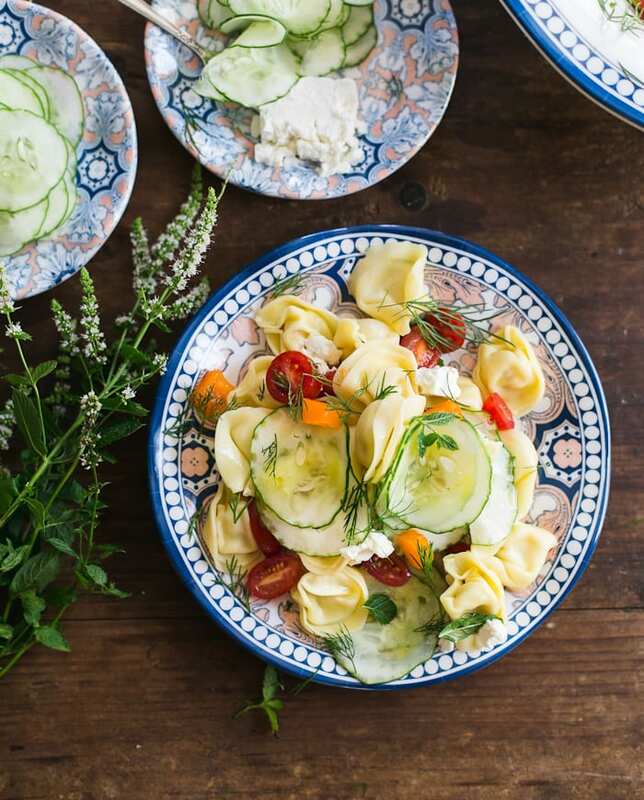 Your tortellini salad looks delicious! My signature summer dish is a corn and bean salad. I use sweet white corn kernels, black beans, halved grape tomatoes, diced avocado, diced yellow pepper, a little minced red onion, some chopped fresh cilantro, minced garlic and a little salt and pepper. The key is the dressing and my favorite is a “Roasted Yellow Bell and Serrano Pepper” dressing from Cindy’s Kitchen. It’s always a hit at picnics and BBQs. And for a casual elegant summer meal I think my bean salad would look PERFECT in the QSquared Diamond Square dishes! Oh this is so yummy! One of my favorite dishes!